I confess, I am a huge fan of Chris Priestleyâ€™s previous work, namely his short story collections Uncle Montagueâ€™s Tales of Terror, Tales of Terror from the Black Ship and Tales of Terror from the Tunnelâ€™s Mouth, and there was also a little World Book Day title concerning more tales of terror in a school. I think these are the childrenâ€™s literary equivalent of the films Dead of Night, or Tales from the Crypt, and that ilk, where we have a central character â€“ a nephew, a brother and sister left alone in an old inn, or a passenger on a train, who are listening to stories being told to them by their mysterious uncle, or an unstable sailor or a strange female passenger. The stories that are being told are eerie, creepy, shocking, gruesome, and may even have a sting in their tale, and between the tales there is a framing narrative being revealedÂ which is building to a nasty climax. Seek them out, I recommend them, but as for Priestleyâ€™s first novel The Dead of Winter? Well, Iâ€™m not the target audience for this book which is aimed for the age-group slightly under the young adult market, so I have to say that I was slightly disappointed in a story that comes across as a mixture of M.R. James (a major influence on Priestley if you read the â€˜extrasâ€™ at the end of the book, along with Poe, Lovecraft and Dahl) and a Susan Hill book, probably her novel The Woman in Black given the remote country setting of this book. 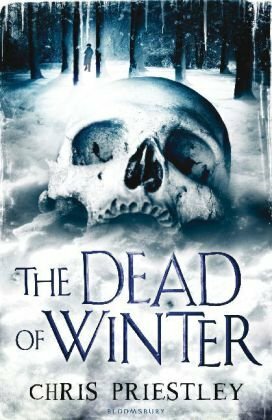 The Dead of Winter tells the story of young Michael Vyner whose mother has died, leaving him an orphan, his father previously having died in action in Afghanistan, killed saving the life of Sir Stephen Clarendon, who has never forgotten that debt and thus makes Michael his ward, summoning him to the remote Hawton Mere which â€˜does not take kindly to strangersâ€™. Sir Stephen is recently widowed, and of a nervous disposition, spending most of his time in a locked tower room being nursed by his sister. Left to his own devices Michael soon realises that things are not as they seem and there is an undercurrent of evil pervading the house. Is it to do with the death of Sir Stephenâ€™s wife, or the strange knocking he hears, or the fleeting glimpse of something in the mirror? Reading the book with an adult eye, I felt that the ideas and situations were a bit rushed and underdeveloped, and the book could have been slightly longer, also the first person narrative slightly detracted from the suspense and ultimate feeling of â€˜dangerâ€™ given that Michael is an adult at the start of the novel and looking back at his life. Having said all that, The Dead of Winter is a welcome change from the usual first person childrenâ€™s fare concerning girls who have fallen for a vampire/ werewolf/ angel/ other, or the slam bang antics of Darren Shan novels; so if it introduces that age group to the classic ghost story and creepy, unsettling, quieter horror then it can be no bad thing.